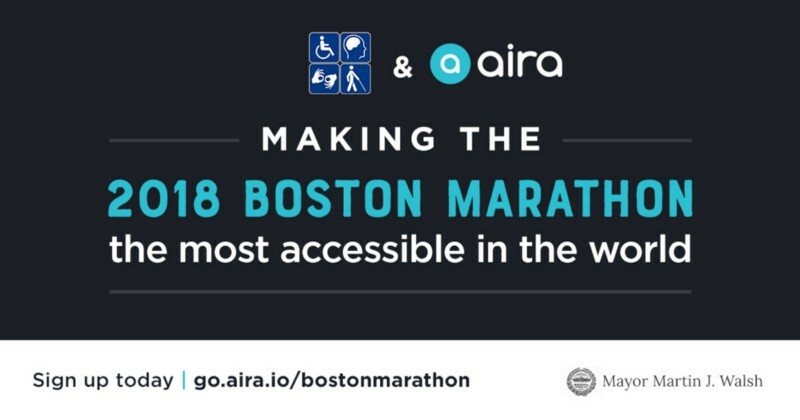 City of Boston & Aira — Making the 2018 Boston Marathon the most accessible in the world. Sign up today: go.aira.io/bostonmarathon. The mayor of Boston’s seal in the lower right. City of Boston & Aira — Making the 2018 Boston Marathon the most accessible in the world. Sign up today: go.aira.io/bostonmarathon. The mayor of Boston’s seal in the lower right. Today, Aira announces details of a partnership with the City of Boston, Mayor Martin J. Walsh, the Mayor’s Commission for Persons with Disabilities, and the Mayor’s Office of New Urban Mechanics, enabling free access to Aira in Boston, April 9th, through April 17th. People who are blind or low vision will be able to use Aira’s service via smartphone, for free all week to experience One Boston Day and the Boston Marathon more independently. Throughout the week, individuals who are blind or low vision can download the Aira app and use it to connect to a remote, sighted agent to access information on-demand. Agents can provide visual descriptions of surroundings and activities, including all the action of the race and events taking place in and around the city. On request, Aira agents can access websites, digital maps, rideshare apps, and other helpful resources on your behalf at the click of a button. Aira Explorer and current para-athlete Ironman world-record holder Erich Manser will be running using Aira this year along with his sighted guide, as part of MABVI’s Team with a Vision. A photo taken by Erich Manser from his Aira Smartglasses during the 2017 Boston Marathon. 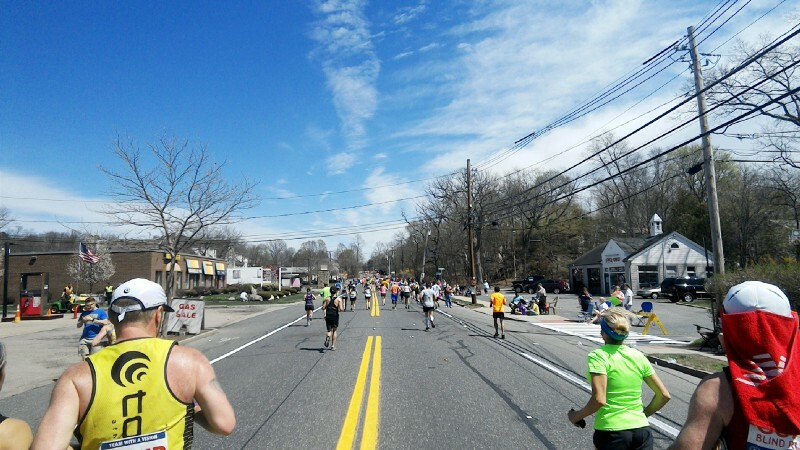 Runners are spread out down the middle of a long, straight, suburban road with double yellow lines. The sky is blue with a few light clouds. To enable free access to Aira’s smartphone app and descriptive services click here or follow the step by step instructions provided below. To enable free access to Aira’s smartphone app and descriptive services click hereor follow the step by step instructions provided below. Step 1 — Download the Aira App. Download the iOS app. Step 3 — Enter your email address and tap on “Sign Up as a Guest’, this is your pre-registration. Step 4 — Open the app and tap on “Call Aira from Phone” to go through a 5-minute training on how to use Aira. You must call in to begin your trial between April 9th-13th. Step 5 — Use Aira anywhere in Boston to experience all the 2018 Boston Marathon has to offer. Aira Guest Access is available throughout the entire City of Boston. Using Aira, you will receive rich audio description about your environment and surroundings, anywhere in Boston, for the 2018 Boston Marathon. It is highly recommended that users pre-register. You must call in to receive your 5-minute training between April 9th and April 13th. There is no cost to you, all calls are free. This is a smartphone only experience, glasses are not provided. A wired or wireless headset is highly recommended. Aira Guest Access will be available in Boston, and along the entire Marathon course from Monday, April 9th to Tuesday, April 17th. Current Explorers are automatically covered. Aira is AI + AR for the blind. The company is on a mission to create smart cities accessible for all. They use wearables with AI-powered human agents to further empower more than 300 million individuals who are blind and low vision globally. For more information, please visit https://aira.io/ or follow @airaio on social. The Mayor’s Office of New Urban Mechanics is the City’s R&D team. Their goal is to pilot experiments that increase the quality of life for all of Boston’s residents and visitors. The Mayor’s Commission for Person with Disabilities mission is to facilitate full and equal participation in all aspects of life by persons with disabilities in Boston. Together, both offices seek to understand the role of novel technologies in making Boston a more welcoming and accessible place for people of all abilities. Augmented reality and human / AI systems hold great promise for this, but many technologies and services are untested in large-scale civic contexts. Toward a broader understanding of how these technologies might benefit the city, both teams are embarking upon a series of experiments to test different approaches in real-world settings.